Reinforce your brand with The Integration Services Module. Integrate your existing corporate website or online platform with your incentive system. Learn more about integrating your incentive system with your online platforms. Integrating your online incentive system creates greater brand awareness and a better participant experience. Your rewards platform isn’t just a tool to drive and influence behaviors. It’s an opportunity your organization provides customers to earn rewards that add personal value to their lives. Shouldn’t they associate that personal value with your brand? 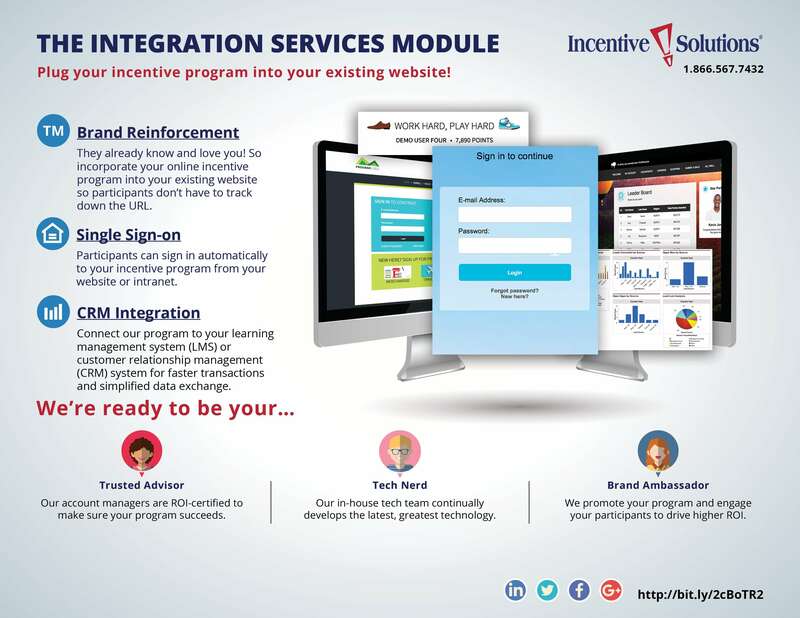 The Integration Services Module creates a more seamless participant experience between your corporate website and your online incentive system. This not only solidifies the connection between your brand and the delight of earning rewards, it enables an easier and more cohesive user experience, increasing program adoption, engagement and results! What are The Integration Services Module’s features and benefits? Integrate your online incentive system into your corporate intranet or website menu. Enable single sign-on directly from your company website or intranet for a seamless participant experience that reinforces brand awareness. Transfer real-time data such as profile updates and point rewards to your incentive platform from existing LMS, POS, data warehouse or other online systems. Configure a personalized, online widget that displays participants’ reward points balance on your website. Which pain points can The Integration Services Module help you solve? Which types of incentive programs should use The Integration Services Module? Which modules pair well with The Integration Services Module? The Integration Services Module automatically carries over reward points and sales data associated with sales promotions scheduled and managed in The Performance Tracking Module. Learn more!